To activate Windows 8, 10 or 8.1, via phone system, please start the Win-8 cmd.exe in administrative mode. Use this solution also for Windows Server 2008 and 2012! See the Windows-8 FAQ-7: ... Start the Windows 8 and Win 8.1 cmd.exe in administrator mode! In the cmd.exe execute "SLUI 4" (execute= Press [ENTER]) (... see Image Arrow-1). After you select this option, you are prompted to select your country or region ( ... See Image-1 Arrow-2 ) and then the corresponding phone numbers displayed ( ... See Image-2 Arrow-1 ). 1. Is the windows 8 or Win 8.1 activated, SLUI 4 not bring phone activation in windows 8! 2. Sometime the W-LAN and LAN has to be deactivated! See Image-3: ... Activate Windows-8.1 via telephone system! 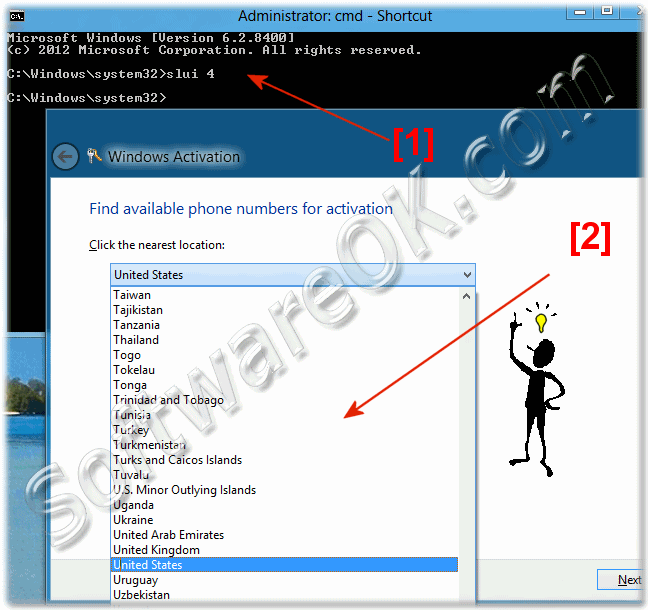 (Image-1) Activate Windows-8 via phone system! (Image-2)phone numbers to activate Windows-8 or 8.1 via telephone system! Phone numbers to activate Windows-8 or 8.1 via telephone system! ... How to activate Windows-8.1 via telephone system! Activate Windows-8.1 via telephone system! Windows-8 - FAQ-40: How can i activate Windows-8 or 8.1 via phone system? What do i need to activate windows 8.1 or Windows 10 via phone, activate windows 8.1 enterprise by phone? Command to activate windows 8 by phone? Open the phone activation windows in windows 8.1 or Windows 10? What command can you use to start the phone activation steps on Windows 8.1 or Windows 10? How to get the phone activation window using in command lin ein windows 8.1? How can I activate my windows 8.1 by phone? Step by step Activate Windows 8 via Phone? Activate windows 8.1 step by step? Register windows 8.1 via telephone, how to birng windows 8.1 phone activation with cmd? Free 8.1 windows phone activation? Windows 8 Activate by Phone? Actiavate windows through phone widnows 8.1? Where is the option active by phone, win 8? How to open windows 8.1 activation by phone? How to activate windows 8.1 pro via telephone? Activate windows 8 over the phone? Activate windows 8.1 using phone? Windows 8 .1 phone activation? Can I Windows 8.1 Activation Command? How to activate windows 8.1 via cmd? Windows 8.1 enterprise phone activation? Windows 8.1 enable phone activation? Command opening phone activation for windows 8.1? How to open windows activation by phone on windows 8.1? Windows 8.1 display phone activation, how to open telephone activation for windows 8.1? Windows 8.1 activation by phone program? Activate windows 8.1 or Windows 10 by phone? Windows 8.1 how is open phone activation, windows 8.1 activate by phone? 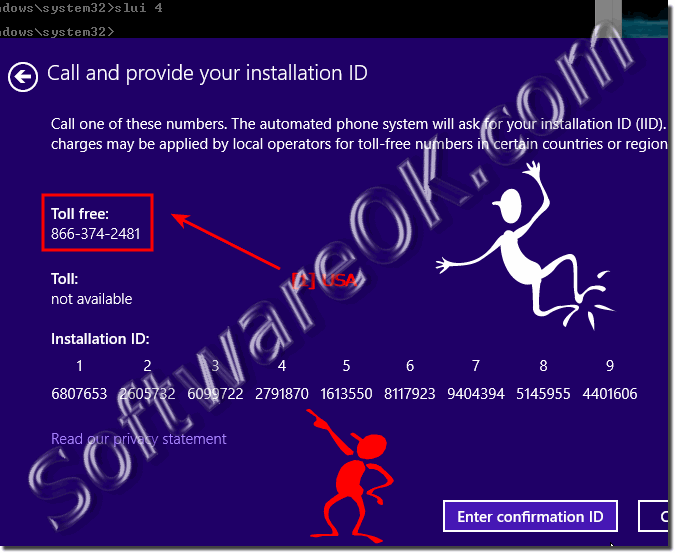 Windows 8.1 phone activation menu, windows 8.1 phone activation command? Step by step Windows 8.1 phone activation? Windows 8.1 or Windows 10 telephone activation command? Activate by phone missing windows 8.1, restore reset win 8.1 slui? How to activate windows 8.1 without internet connection? Windows 8.1 activation over phone run command? Where is option for activate by phone in windows 8.1? Windows 8.1 Activate via mobile phone? How to activate windows 8.1 or Windows 10 without internet connection? Free activate windows 8.1 pro activated by phone? Windows 8.1, phone activation disappeared? Slui 4 windows 8.1 or Windows 10 not working? How to activate windows 8.1 pro through phone? How to enable command prompt in Windows Phone 8.1? No phone activation windows 8.1? Windows 8.1 or Windows 10 phone activation, windows 8.1 ready to activate got stuck? How to activate windows 8.1 with phone? What is the run command to bring up the activate windows by phone? Windows 8.1 phone activation command? Windows 8.1 phone actvation shortcut? Can I Windows 8.1 activation phone? Open phone call activation for win 8.1, phone acivate windows 8.1 cmd? How to activate windows 8.1 run command? Shortcut to windows 8.1 activation by phone numbers? Run command phone activation windows 8.1? Activating Windows 8.1 without internet connection? Activate by phone windows 8.1? Windows 8.1 phone activation how to enable? Command start phone activation steps on windows 8.1 or Windows 10? Can I Activate windows 8 by phone? Phone activation windows 8.1 ms answers, windows 8.1 activate by phone system? Windows 8.1 activate by phone enable, windows 8.1 activation by phone? How to activate windows 8.1 without an internet connection? How to activate window 10 without internet connection? Step by step Phone activation windows 8? How to activate windows 8.1 or Windows 10 by telephone? How to bring up windows 7 phone activation from command line? Windows 8.1 phone activation command prompt? How to activate windows 8.0 via phone? Activate windows 8.1.1 old system? Windows 8.1 activation no phone option, activate windows 8.1 mak by phone? Command to bring up windows 8.1 or Windows 10 telephone activation? How to activate window 8 without steps Internet? Hoe to activate windows phone 8.1? Activate windows 8.1 over phone number, how to open win 8.1 activation by phone? Instruction to activate windows 8 by phone? Activate windows 8.1 over phone call? How to activate windows 8.1 without internet? Run command windows 8.1 phone activation? Activate windows 8.1 with media center via cmd?